Russian saber fencers stunned Ukraine in the women’s team final 45-30 earning Russia its sixth gold at the Rio Olympics. Fencing has been extremely successful for Russia at the games so far, with four gold medals out of six claimed in the discipline. The Rio Olympic champion in individual saber Yana Egorian, silver medalist Sofya Velikaya and Yulia Gavrilova beat a Ukrainian team led by 2008 Beijing Olympics team champion and Rio bronze medalist Olga Kharlan in an epic final battle. Team Russia coach Ilgar Mamedov said that Russian fencers were fighting with great passion from the beginning of the match, which was a key to their overall successful performance. “It was important that they managed to break away at the very start. The girls were on fire and led the fight to victory,” he said. Political tensions between Moscow and Kiev did not have any effect on the team, Mamedov said. He stressed that politics should be separate from sport. “Let’s not get mixed up in politics,” Mamedov told TASS. — Иван Короткий (@fokctrot) 13 августа 2016 г. Immediately after the match, Ukrainian fencers shook hands with their Russian rivals, congratulating them on their victory. Ukraine were reigning Olympic champions in sabre’s women’s team fencing, having won the first ever competition of this kind in 2008. Russia finished fifth back then. — Дмитрий Симонов (@dmitriy_f1re) 13 августа 2016 г. 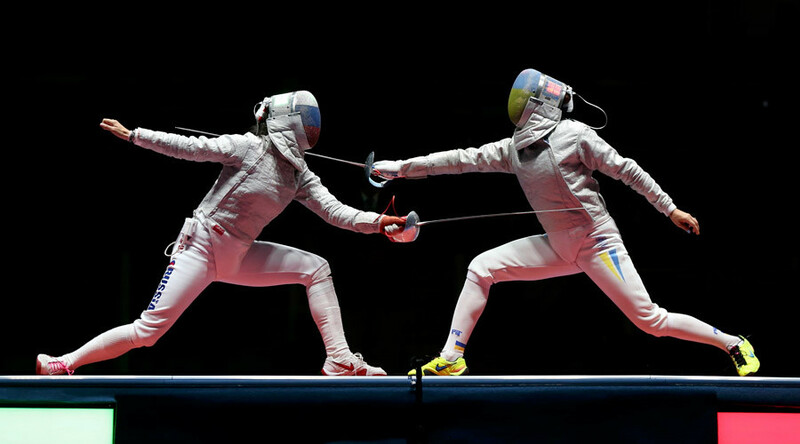 Ahead of the final, the president of the Russian Fencing Federation, Aleksandr Mikhailov, also denied that politics would play any role in the fight. “Are there political nuances in the match with Ukrainians? No. What politics? They are friends with each other, get on well. We always congratulate Olga Kharlan [Ukraine’s team leader], Mikhailov said. In a fight for bronze the Americans, who lost to Russia in the semis, beat Italy 45-30 to claim the US team’s first medal in fencing at the Rio Olympics. Commenting on the victory, Velikaya said she was dedicating the gold medal to all the Russian athletes banned from competing. The 31-year old, a seven-time world champion, added that she is not considering ending her career in fencing yet. “I’m going to continue until Tokyo [Olympics]. I’m not retiring,” she said. Hardly had anyone anticipated Russia’s dominance in fencing at this Olympiad, even Mamedov himself, who had made a probably too daring pledge ahead of the Games. — Свободная пресса (@svpressa) 13 августа 2016 г. “I promised the guys to shave my head if we win two gold medals in Rio. I’ll have to fulfill the promise. As soon as the Olympics end, I will do it. Am I ready? To what exactly should I be ready? Take the razor and simply do it”, he said, as cited by R-Sport.